More than 2,000 participate in toast in honor of Jerusalem Affairs Minister Ze'ev Elkin, who is running for mayor of the capital. Over 2,000 people took part Sunday in a toast in honor Jerusalem Affairs Minister Ze'ev Elkin on the occasion of the Jewish New Year. Also participating were Likud ministers Yisrael Katz, Haim Katz, Tzachi Hanegbi and Ayub Kara, former Jewish Agency chairman Natan Sharansky and many members of the Likud party. 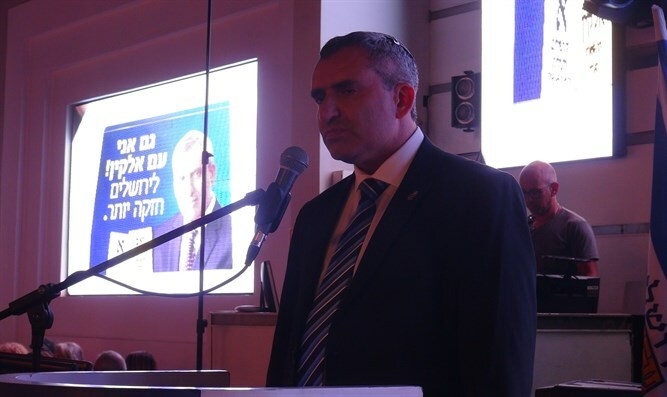 Prime Minister Binyamin Netanyahu appeared in a video at the event in which he called on residents of Jerusalem to vote for Ze'ev Elkin in the upcoming mayoral elections. The time has come for Minister of Jerusalem Affairs Zeev Elkin to be the mayor of Jerusalem," said the prime minister. "I know what he did for Jerusalem, I know what he did for Jerusalem, and I think we have done great things in recent years, but together with your excellent leader and with the support of the government, we will do tremendous things. So I ask you to vote for Ze'ev Elkin. " Minister Elkin said in his speech: "Look around, there are young boys and girls here, men and women, religious, secular and haredi, immigrants and veterans, residents of the city center and residents of the surrounding neighborhoods. That is what characterizes us and that is what will always characterize us. We are not looking to sow public discord but to be united and lead Jerusalem. You are this connection."